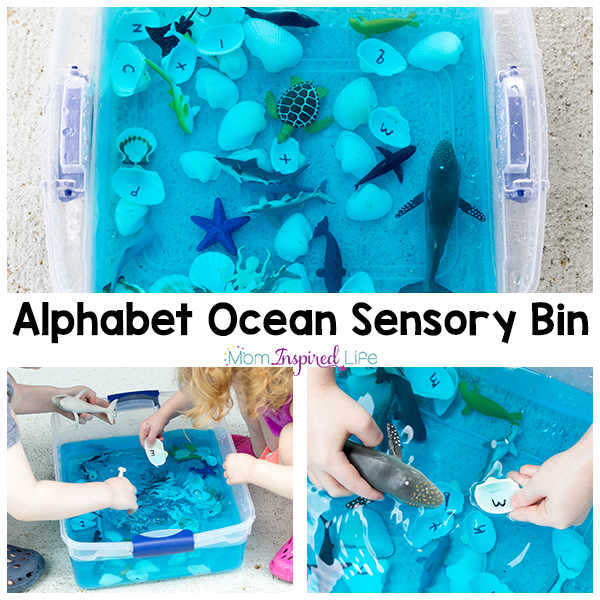 This alphabet ocean sensory bin is perfect for summer. 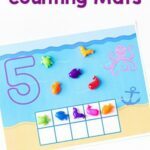 Let your kids beat the heat while exploring the ocean habitat and learning letters at the same time! My kids absolutely love playing in sensory bins. 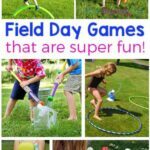 They always go over well and keep the kids busy for quite a long time. They are usually very quick to put together too. 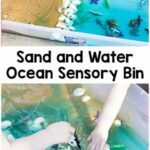 Although we do play with them indoors, I think they are awesome for summer because you can do all kinds of messy bins outside and not have to worry about the clean up as much. 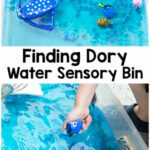 A water sensory bin like this one is perfect for cooling down on a hot summer day too. 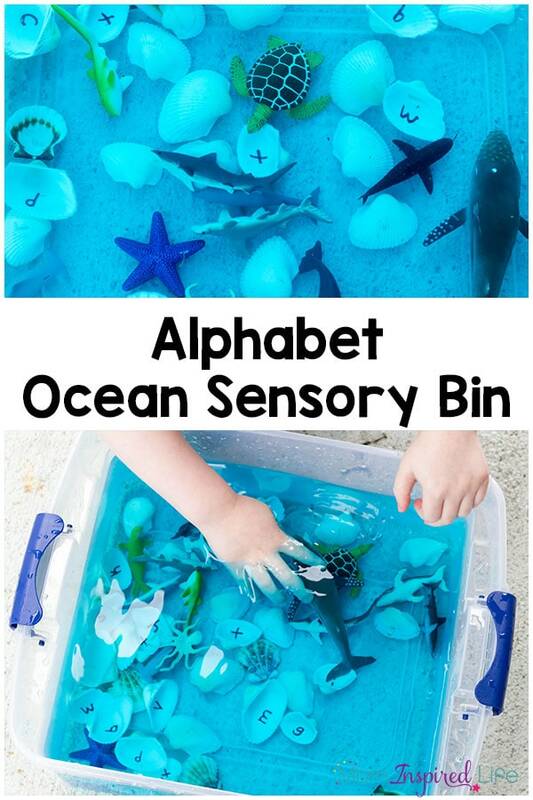 While playing with this ocean sensory bin, children will learn about the ocean habitat, letters of the alphabet and even letter sounds. 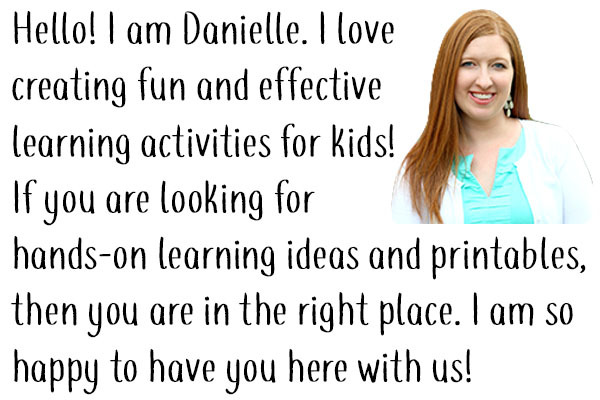 All in a playful, hands-on way! 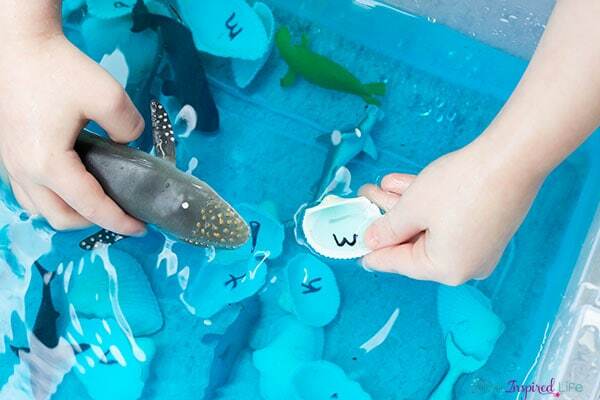 Write a letter on each shell with a permanent marker. 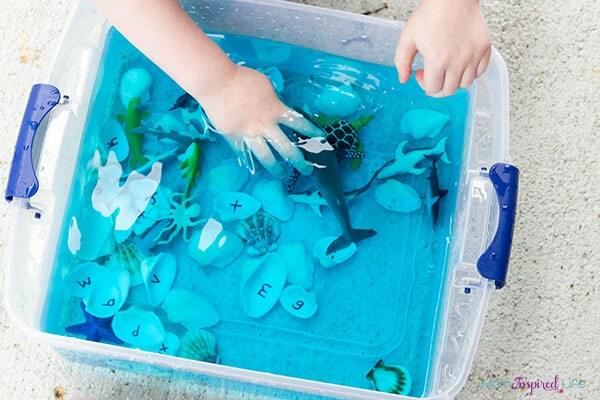 Fill the bin about half full with water and dye it blue with a few drops of food coloring, if you would like. 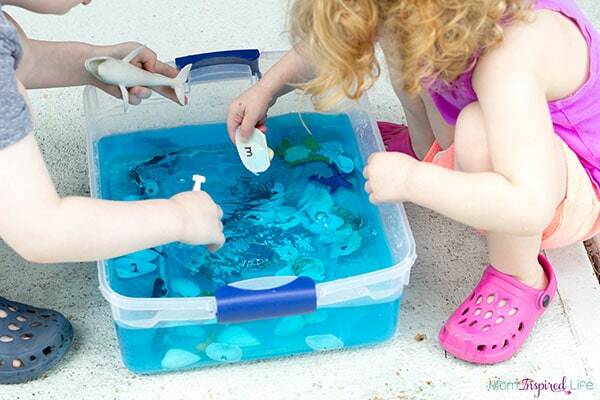 Add the ocean animals and shells to the bin. 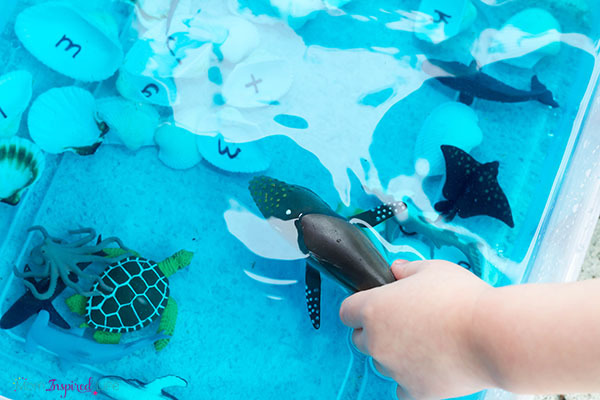 I let the kid play freely in the ocean sensory bin for a little while. At the beginning, they didn’t pay attention to the letters on the shells. But eventually my 5 year-old started taking notice of the letters and asked about them. I just simply told him I thought they would be a good addition to the bin because he could get some more alphabet practice at the same time. I then asked him if he could go on a hunt in the bin and find the letter m. He thought that was a fun idea and went searching. We did that a few times. Then I suggested that maybe he could find the letter that whale starts with because he had been playing with a whale. He quickly realized that whale started with “w” and began looking for it. We did that a couple more times with other animals in the bin. My toddler just enjoyed playing in the bin, but she was listening to our conversation about letter names and even repeated a few. I have already noticed that she has added a few letter names to her vocabulary as of late. I know this is because she is nearby while we do activities like this. I think it is so great that she is just playing while picking up the letter names. This is sure to be a go-to summer cool-down activity! 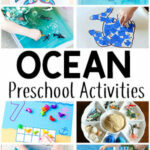 Here are some more ocean activities I think your kids will love!